Over dinner the other night, a friend brought up ongoing public health efforts to get people to stop washing raw chicken because it spreads Campylobacter onto kitchen surfaces. I have to confess that I have been washing, drying and salting a raw chicken nearly once a week for years, following Judy Roger’s (Zuni Cafe) fabulous recipe for roast chicken. 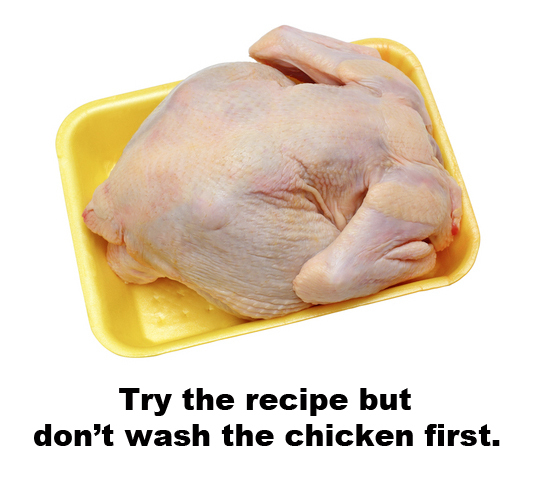 We have reported on chicken washing before (see http://microbe.net/2012/11/12/a-microbiology-of-the-built-environment-story-of-the-day-dont-wash-your-chicken/) but washing raw chicken is a surprisingly hard habit to break. There was some more recent press on this topic back in June in honor of Food Safety week (in the Mirror and BBC News), including this “germ-vision” animation of bacteria flying onto kitchen surfaces (not that any self-respecting germaphobe would keep clean plates of food next to the sink). Try the recipe but don’t wash the chicken first. All that salt and cooking will take care of the bacteria. I’m going to reply with the same comment I did in the last story… I’ve always though of washing a chicken as being about getting rid of the chemicals that they dip the chicken into at the factory and not about removing the bacteria. So if I still bought chicken (I don’t) then I’d probably wash it anyway. Just like in Portlandia, I only eat pasture-raised chicken from a local farm (though I don’t ask for its name). But this video on an automated poultry processing plant may be enough to make me go back to being a vegetarian: https://www.youtube.com/watch?v=rdrQwQNoGTI Note the live hanging chickens and that no one wears gloves.